Ali Calkins obtained a Bachelor’s Degree in Equine Studies, specializing in training, from Delaware Valley College in 2005. 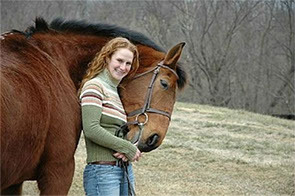 Ali was highly active in the equine programs in her college years. She was an active rider on the Intercollegiate Team for four years, and qualified for Regionals, Zones, and Nationals her senior year when she was also captain of the team. She was also a member of the Drill Team and other affiliated clubs and organizations. In 2007 she obtained her Level 2 British Horse Society Certification for Riding and Stable Management. After college she pursued jobs in Virginia, Pennsylvania, and Maryland, working under other professionals managing, training, and teaching. In 2008, Ali began working for FEI rider Christine Betz, as assistant trainer and barn manager, and two years later built Forward Strides from her existing clientele. Ali continues to train with Christine on a monthly basis as well as with other professionals, and offers instruction and training in Frederick, Howard, and Carroll Counties. 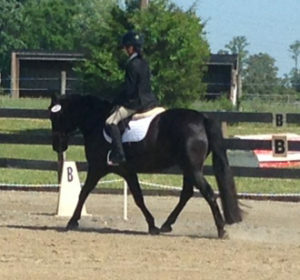 Beginning in 2013, Ali began her venture with her Appendix/QH mare, Emma, whom Ali retrained herself, beginning with Eventing and then moving to recognized Dressage competitions to begin working towards scores for a USDF Bronze Medal. By the fall of 2014 Ali had accomplished all 6 scores needed, competed at the CBLM Championships, received a PVDA Second Level Rider Achievement Award for outstanding scores, and is now competing Fourth Level and working toward scores for her Silver Medal. In 2017, Ali began working on musical freestyles with Emma, and in 2018 achieved her Bronze Freestyle Bar. Ali specializes in breaking down horse and rider issues to identify the source of the problem, then works back up once the basics have been re-established. She is deliberate in her training methods and will not rush to meet a goal before the individual or horse is ready. She takes the time to understand the individual she is working with and tailors training sessions to meet their unique needs. Ali’s husband Mike is a soil conservationspecialist for Howard County. In addition to helping Ali with the horses, he makes sure our pastures and fences are in tip-top shape for the horses and inspects our incoming hay to be sure it is of the best quality. Ali began working with Emma in 2010. It was clear she needed a fresh start as she was very unsure of herself and her job. Emma has an incredible work ethic and has been an amazing horse for Ali to work with. 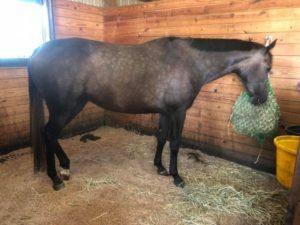 She enjoys finding what each individual horse will succeed in and Emma seemed to take to Dressage nicely, enjoyed jumping, and LOVED cross country from the first time she went schooling. In 2012, Ali and Emma competed through First Level in multiple Dressage shows and Horse Trials at the local level, always with incredible scores and clear jumping rounds. The following year Ali began competing Emma in Dressage shows at the recognized level and achieved her Bronze Medal in 2014, and her Bronze Freestyle Bar in 2018. Ali and Emma are currently competing at Fourth Level and schooling Prix St. George. In the future, Emma will be offered for lessons. Stella is the baby of the barn, sired by Legaczy (RPSI). At inspection she was registered as a “Gold Premium” foal. Ali plans to begin Stella’s training in the winter of 2018, with the goal of competing her in the Hunters. Ali and Anna came together in 2008 when Ali started working for Christine Betz. Originally a broodmare, bred to impressive Welsh Stallion, Glencoe Jester, Christine purchased Anna and started her undersaddle. After a year of working together Ali saw Anna’s incredible talent and purchased her to continue her training and begin competing. 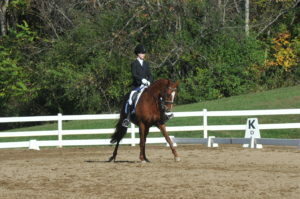 Anna has been trained through third level Dressage, and competed in Show Hunters and Jumpers. In 2012, Ali and Anna came in 5th in the .9m Swan Lake “B” Jumper series. 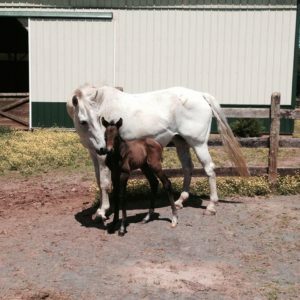 On May 21st of 2015, Anna foaled a healthy, beautiful filly by Legaczy (RPSI). “Stella”, as she is known around the barn was registered with Westfalen as a “Gold Premium” foal. Bubba is Ali’s little gem. She has had him since he was 3 years old and he has been the star teacher for Ali’s young students since she started Forward Strides. Prior to being a lesson pony he was shown extensively in both local and rated Hunter/Jumper Shows. He also excels in low level Dressage and enjoys cross country jumping! (c) 2019 – Powered by WordPress, Theme by Theme Blvd, created by KatmarCreative.